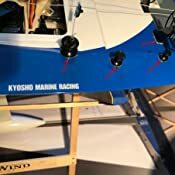 The Kyosho Seawind has captured the stunning style and performance of JF class racing in an RC model worthy of these majestic yachts. As the captain, you have control of the helm and precise trim of the main sail and the jib. 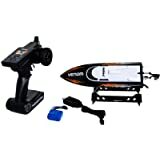 A high-resolution RC system delivers your commands to the boat in the most smooth and proportional manner. 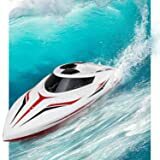 The RC system also operates on the 2.4 GHz band, which means you don't have to worry about frequency control or another RC vehicle interfering with the operation of your boat. You simply turn on the transmitter, and the rest is maritime bliss! 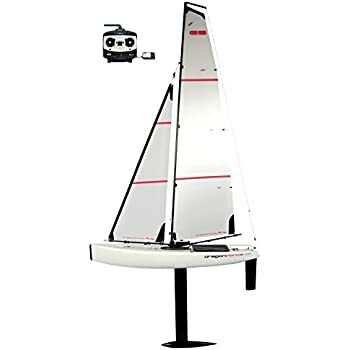 The hull features a deep fixed keel with a bullet weight to help keep the boat as upright as possible as the massive sails fill with the wind. 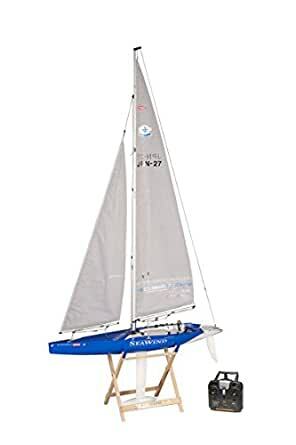 Metal-geared servos handle sail and rudder movement, and the rudder uses a more durable push-pull linkage arrangement. 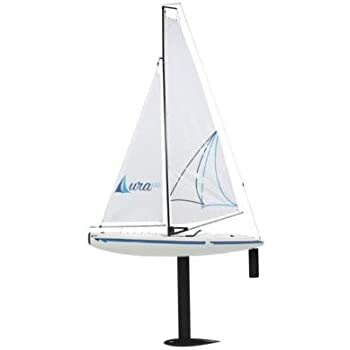 The Seawind has a unique ability to accelerate sharply after rounding a marker. She's also efficient in light wind, so you can play the wind shifts like a pro. 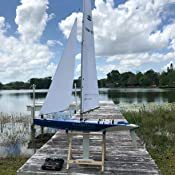 The Seawind includes a molded one-piece ABS hull, factory finished fitted with a 2.4GHz RC system that automatically manages frequency band selection. How long before you're sailing? The Seawind is pre-rigged as much as possible to make raising the mast and sails as easy as possible. Installing the keel should take less than a minute. It should take about an hour to get the big mast and sails installed and trimmed, and have the keel in place. You'll be heeled over with full sails in no time. 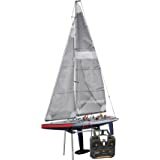 The mast, keel and rudder can be detached quickly without the use of any tools for compact storage and transportation, or you can make use of the included display stand and leave the big Seawind on display for all to enjoy. 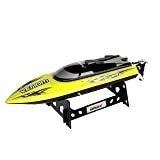 It stands over six feet tall, so it's a impressive conversation piece when you're not out on the water. 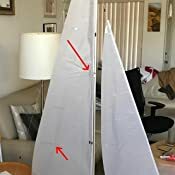 Very low quality (excess of glue on deck parts, wrongly folded sails that have permanent creases, general low quality of details). On top of that reseller requested payment for return but giving only PO Box thus forcing to pay nearly $300. Worst shopping experience in a long time! 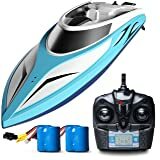 4.0 out of 5 starsFun Boat, Great Radio! 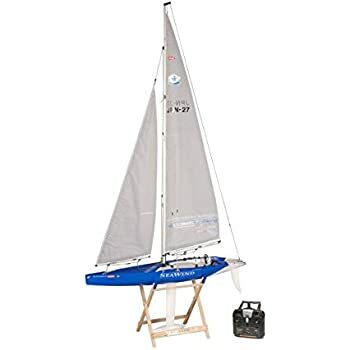 This is my first Sailboat! After repairing the hatch with a two-part epoxy bought at the grocery store and using a screw from an old hard drive to mount the rudder, I've had nothing but pure enjoyment with this boat. With the radio's range, I sailed it to the point I could not tell which direction it is heading. 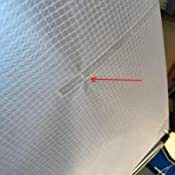 I did not have any of the sail issues mentioned in the other review. These boats have been around for years with thousands sold. In years past they were sold as kits. The market has changed and more people don't want to bother with building kits. Kysoho now offers these terrific boats fully assembled - you do have to set up the rigging (sails and mast etc) but anyone with average intelligence can handle the minor assembly. 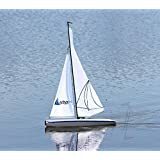 These boats are well made and sail well in a wide range of conditions. There is one issue you will need to address when you get yours. The factory hatch cover is not water tight. Easy to fix. 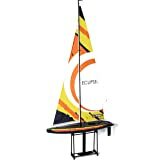 I have been involved in RC sailing for 10 years - currently have 14 RC sailboats. I have two Seawinds in my fleet. Best I can say is they are time tested and Kyosho is a good company should there be any warranty issues. 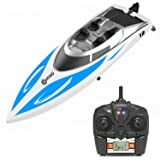 These are great boats, but do not pay more than $350, at which price they are available in many places. Went together just fine per manual. Servos a bit weak but easily upgradable online like Amainhobbies for cheap. Recommend a rechargeable battery pack for receiver Nimh or Life- use a balloon and small zip tie for water proofing receiver but remove after each use to allow for drying. Other than that sat on my dock, glass of white wine nearby and sailed for an hr... Love it. Kyosho is a serious RC brand. 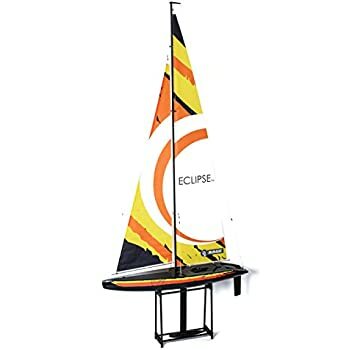 My ten year old son spent all of his money on this boat. He used it maybe 10 times and took such good care of it. Always rinsed it and dried it off after each use. 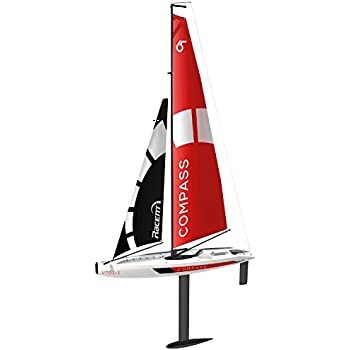 Nevertheless, the sail servo failed and their replacement part is on back order and costs 70 dollars. They sent us to a different supplier for a similar part and that supplier told us that the part kyosho recommended was not waterproof and the wrong size.(!) Needless to say, we are very disappointed and feel ripped off by Kyosho. They must have a problem with this part as it is backordered. So, you have been warned.